Powers/Abilities: Captain Albion possesses heightened strength proportionate to Brian Braddock, the Captain Britain of Earth-616. She presumably possesses the power of flight and some heightened sensory abilities, as displayed by most other members of the Corps, but they have not been documented. 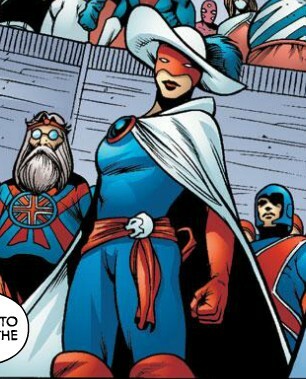 History: (Daredevils#6) - Captain Britain of Earth-616 was brought to Earth-522 as a witness to the Dimensional Development Court's trial of their former Majestrix, Saturnyne. Once there, he was introduced to their native protector, Captain England, as well as Captain Albion "temporarily on loan from the Earth next door," who were to act as DDC-approved chaperones. (Daredevils#7) - When Captain Britain attempted to disrupt the trial, Captain England and Captain Albion temporarily subdued him. When he later broke free of their bindings, resulting in a riot in the courtroom, the two of them did battle with him. He managed to defeat the pair. (Mighty World of Marvel#13) - Following Merlin's apparent death, Captain Albion as well as the rest of the Corps attended his funeral. She attempted a reconciliation with Captain Britain, seeking to congratulate him for his role in the defeat of Mad Jim Jaspers, who posed a multiversal threat. She took his hand and placed it on her heart with the words, "Well met, bravest of Captains!" 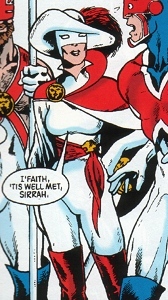 (Excalibur I#43-47) - Captain Albion, along with other members of the Corps, were present at the trail of Captain Britain, who has been perceived to be in violation of the Corps' morality code. (Top Ten#8, published by ABC Comics) - Captain England and Captain Albion were seen together on vacation in the city of Neopolis, which has been documented as having links to alternate universes. (X-Men: Die By the Sword#3) - When Mad Jim Jaspers reconstituted himself in Otherworld, and began transforming whoever crossed his path, including Corps members who confronted him, into Fury facsimiles, Roma summoned the Corps, including Captain Albion (in a revamped costume) to defend the Starlight Citadel. The Corps attacked Jaspers and his Fury army, but were decimated. (X-Men: Die By the Sword#5) - After Jaspers' body was usurped by the resurrected, Earth-238 Fury, and it in turn was destroyed by the reality-hopping Exiles, rogue Corps member Albion (Bran Bardic) and Earth-616's Excalibur, Captain Albion and other Corps survivors (Captain U.K., Justicer Bull and Maid Britannia) gathered in the ruins of the Starlight Citadel around the body of Roma, who had been slain during the battle. Led by Saturnyne, they formed a cortege around Roma's coffin and escorted it away from the devastation. (Uncanny X-Force I#19) - Captain Albion was one of several Corps members sent to arrest Earth-616's Fantomex. (Uncanny X-Force I#20-23 - BTS) - Captain Albion presumably helped defend Otherworld from the forces of the Goat Monk (see comments). Alan Moore intended Captain Albion's Earth to be a neo-Elizabethan England whose empire embraces America and most of Asia in a golden age of peace, enlightenment and prosperity (based on the Michael Moorcock novel Gloriana). A Captain Albion one-shot strip was tentatively planned, but abandoned when he ceased doing fanzine work. The novel Gloriana takes place in a universe in which the religion is definitely pre-Christian pagan. "Od" would refer to Odin, and not the Christian God. (Excalibur I#125 [BTS}) - Captain Albion joined her fellow Corps members in attending the wedding in Otherworld of the Earth-616 reality's Brian Braddock and Meggan. (Excalibur II#1 [BTS])- Presumably, Captain Albion was among the members of the Captain Britain Corps that were slaughtered by Mastermind and the Warpies. The second of these would seem to have been disproven by her still being alive and well in Die By the Sword. On the other hand, Captain Empire was seen amongst the fallen Corps members in Excalibur II#2, but still showed up in Die By the Sword#3, while Brother Brit-Man was clearly hit by a Fury with what looked very much like a fatal blast in Die By the Sword#3, but appears alive and well in Uncanny X-Force I#19. We know Merlyn and Roma had the technology to resurrect people so long as they had some remains to work from, so perhaps the Corps got rebuilt that way (in which case Captain Albion might have been amongst the dead in Excalibur II#1 after all); alternatively, given a virtually infinite multiverse and realities constantly diverging from one another, dead Corps members might be getting replaced by identical counterparts, in which case we can't be sure that all of the appearances above are of the Reality-523 Captain Albion. However, for this profile's purpose, we're going to keep assuming it's all the same person, unless and until we get solid evidence otherwise. In Die By the Sword#4, the Corps rally and launch a mass attack on Jaspers, who then drains the life energies out of all of them; Albion's presence alive and well in the next issue clearly shows she escaped this fate. Presumably she'd been knocked out the fight off panel some time in #3, and so wasn't part of the attempt to rush Jaspers en masse in #4. She doesn't show in #5 until after the fight ends, and after the heroes have begun hunting amidst the rubble of the Starlight Citadel, so perhaps she was trapped under some debris until one of the searchers found her. Even though we don't see her in the subsequent issues of the Uncanny X-Force Otherworld story, since Uncanny X-Force I#20 reveals that Otherworld is under attack from the forces of the Goat Monk (a future incarnation of Jamie Braddock) at the same time as Fantomex was being apprehended in Uncanny X-Force I#19, Captain Albion is presumably present off panel fighting alongside the other Corps members. Her real name was revealed in the Corps' profile in OHotMU A-Z HC#2.